Join us for a celebration of the power of creative expression & mental health. 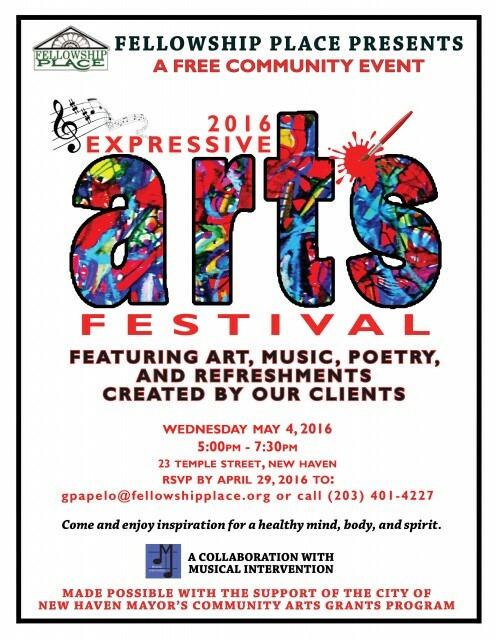 The Expressive Arts Festival will kick off community celebrations for “May is Mental Health Awareness Month”. Fellowship Place hopes this event will expose the public to the artistic talents and accomplishments of people living with a mental illness, promote mental health awareness and reduce the stigma associated with mental illness. MINDMAP CT, a collaboration between the Yale Dept. of Psychiatry, the CT Mental Health Center, and the CT Dept. of Mental Health and Addiction Services, will sponsor a booth at the festival with information about the early detection and treatment of mental illness. Fellowship Place seeks to help adults with mental illness lead more meaningful, fulfilling and healthy lives by offering resources, education, and opportunity. The agency provides a wide range of services, including supportive counseling and case management, supported housing, job training and career development services, social & physical recreation programs, expressive arts therapy, and skill building groups. More than 650 people a year are served.